You are here: Home / Nature News / Nature News / Bird Brains or Brainy Birds? Bird Brains or Brainy Birds? Everyone has heard the derogatory term, “Bird Brain”. What about “The Wise Old Owl”? Are birds’ brains full of nothing but fluff? Or are they wiser than we give them credit for? The truth lies somewhere in between. Owls, long associated with Athena the Goddess of Wisdom, have the reputation of being wise and all-knowing. It is true that these silent predators perform their ecological roles wonderfully. Tawny Owls are fearless defenders of their nestlings and have caused serious injuries to many who wander too close. Barn Owls can hunt in complete darkness, triangulating the location of their prey with their sound capturing facial disks and off-set ears. Great Horned Owls can carry away prey that weighs as much as they do. However, owls aren’t doing calculus. Their immense eyes can see their prey by the light of one candle. Their enormous mouths can swallow a rat whole. Put the eyes, ears and mouth together and that leaves very little room in an owl’s skull for a brain. Approximately 1/3 or less of the skull’s volume is dedicated to owl brain. 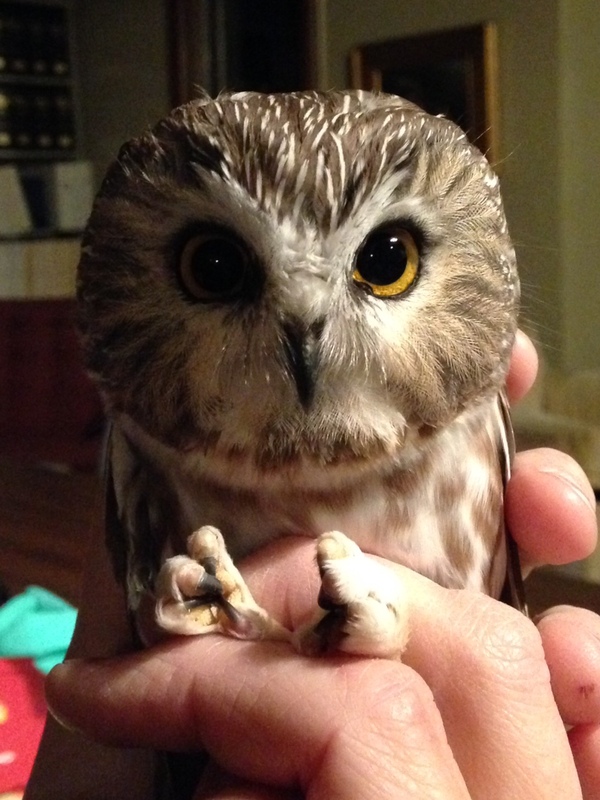 Nevertheless, owls have all the intelligence they need to survive. Psittacines and corvids are at the other end of the brainy bird spectrum. “Alex” the African Grey Parrot learned more than 100 English words that he used appropriately to name and describe objects. Alex could even combine known terms to describe a previously unknown object. Another example of intelligent birds are Crows, Jays, and Ravens. During the past decade many research papers have documented the intelligence of crows through observations of New Caledonian Crows. These birds will use tools, a feat once thought to differentiate intelligent creatures from the less mentally-gifted. Not only do these crows use tools, they have been caught on video, creating tools to solve problems. What about our backyard birds? Chickadees have tiny brains but this doesn’t mean they aren’t adequately equipped in the cerebral realm. To survive our brutal,snow-covered winters, chickadees collect and store large amounts of seeds. After snow blankets the earth, these tiny passerines must remember where all those seeds are stored. During the fall the portion of a chickadee’s brain that is responsible for remembering these food cache locations actually increases in volume by 30%. The chickadees brains grew new neurons to improve the efficacy of their memory. After the winter the birds’ brains decrease in size, only to expand again the following autumn. Contrary to early beliefs, the growth of new neurons during adulthood isn’t isolated to birds. There is evidence of limited new neuronal growth in the hippocampus, the part of the human brain associated with memory, even in adult humans. Scientists hope to learn more about this process in order to combat brain altering diseases such as Alzheimer’s and Parkinson’s. https://carpenternaturecenter.org/wp-content/uploads/2016/10/Whitefaced-Owl.jpg 1280 960 Carpenter Nature Center https://carpenternaturecenter.org/wp-content/uploads/2016/08/carpenter-nature-center-logo.png Carpenter Nature Center2016-10-09 18:20:272016-10-09 18:22:28Bird Brains or Brainy Birds?